“Linda Isle” is an exclusive guard gated island with some of the most enchanting properties on the bay. 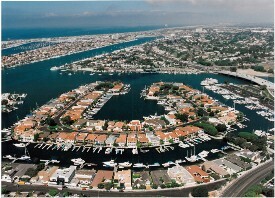 Unlike Harbor Island, Linda Isle’s 108 homes have spacious front yards with pleanty of parking. It’s almost as if you’re in an ideal high-end suburban community but with a major added benefit, every house is on the water. As you can see from the map, this island’s horseshoe-like shape gives each home the space that comes at a premium in Newport, especially on the waterfront. There is a huge difference in price with regards to the location of each property. A 4500 sq ft house on the East Side of the island, overlooking PCH, would command only one-fourth the price that it would on the West Tip. Lot size and views are what make the difference. If you’re not as interested in the main channel view as you are in providing a waterfront home for your “sixty footer,” than the East Side of the island provides great deals. Prices on Linda Island are certain to remain strong and their appreciation has proven this. Although not considered as prestigious as Harbor Island, Linda Island has many homes that are worth more than some of those on Harbor Island. “Linda” is home for some of California’s most successful and famous. Some residents have have a net-worth in the billion dollar range.